» Forum » Tech » Tech: Generic » Can this hack be fixed? Will it be reliable? » Can this hack be fixed? Will it be reliable? Can this hack be fixed? Will it be reliable? A week later the left flipper has blown a fuse, I replace the fuse, turn the game on and the flipper Locks on .. I check q-15,Q16. Looks like a hack from the top ..
Just because guns and soldering irons are cheap, does not mean that everyone should use them. That is an awful repair but it might last a while. If it were in my possession, I'd fix it better. Keep some extra fuses handy. Thanks for the input , ordered a few transistors from pinball life (man they ship fast) ..I guess to "fix it better I would have to rebuild traces and pads ... I Never have done that .. I did see a trace pen at the local electronic supply store ... It was heavy and 70 bucks, it had silver in it . They also had a flux pen , anyone ever use one of them .. 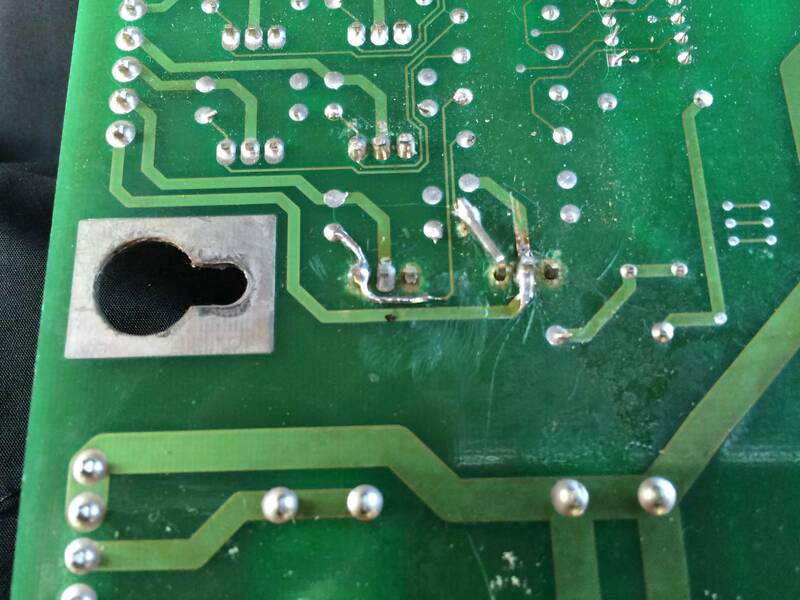 If you want to do the repair: read-up on soldering, buy the right tools and practice on something less valuable than a pinball circuit board. 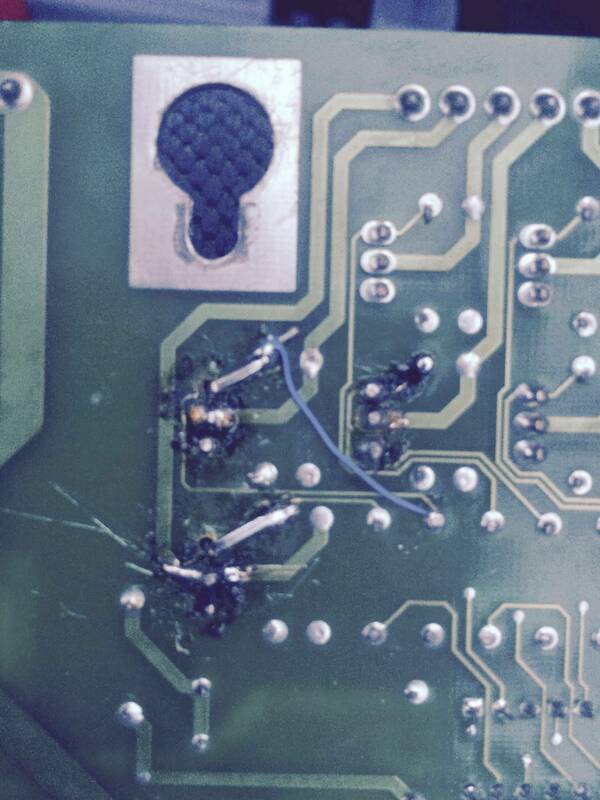 Working on a board that has already been hacked is not the easiest of repairs. Skip the trace pen (they're worthless in this type of application) and when you're first starting out some additional flux will make your life a lot easier. Even experienced solderers use flux when de-soldering. Even experienced solderers use flux when de-soldering. Post that pic in the worst hacks thread. That looks like something I would have done the first month I started doing electronics in High School. Cool soldering in high school , we didn't have that class ..
From my experience ,soldering transistors is easy business..with a cheep pump and loads of flux.. I like lots of flux , flux just seems to conduct heat upon contact .. But man these modern machines have tiny traces . The soldering trace pen was way too expensive for me anyway and it seemed gimmickry .. I've had crap luck using braid.. What about a flux pen ? I personally would get a desoldering iron and get all the old crap out of there, then resolder them. Then as far as that broken trace, using a piece of wire isn't such a bad idea if it done neatly. Those trace pens can leave broken contact spots and the tight space of those fine lines may make it very difficult to make some nice clean lines. Better than paying a huge chunk of change to buy a new board. But if that's the route you go, that board is the 520-5137-01 on Austin Powers. The trace pen will work but not when you have to cross over another trace, thats why a wire or a copper trace repair kit would be best. This hack job would be reliable, it just isnt neat or pretty. But since you have to replace the transistor, I would straighten up that mess. You would have peace of mind for your pin and future reliablity. Neither did we. I had my dad's soldering iron and broken machines that I would try to "fix". You can solder on the top side of the board when someone destroyed the through holes. You can use wire leads to stitch the blown out holes too. Your fix looks fine as long as there is continuity everywhere. My compliments to you. You did an excellent job of cleaning up that board. The MPU on my STTNG was about as bad. To add insult to injury, the person who had hacked it decided that it would be a good idea to cover over the hack job with blobs of silicon. Lot's of fun to clean up. Completely depends on the board you're looking at and what condition it's in. A board where the solder is dull and not shiny often desolders 10x easier if you use a little liquid or paste flux. Resoldering the part before desoldering accomplishes about the same thing, but then you're heating the board up one more time. Liquid flux is inexpensive, works well, and easily cleaned up. I'd rather be 'safe than sorry' in applications where the traces are fine and not forgiving - like a RAM chip on a WPC CPU. Don't be afraid of flux, just make sure you clean it up when finished. Liquid flux is inexpensive, works well, and easily cleaned up. I probably overuse my liquid flux pens, always use them it on SMD stuff and mostly on corrosion jobs. I have yet to run into the issues people say can happen from using it too much (it is an acid, so it eats away at the surface of the copper to make a better bond, but it isn't like you're pouring feric-chloroide on it). The paste I only use on coils, pots, and and ground connections that require higher heat, and if something previously had flux on it, I don't use it.